Many, many sold to satisfied customers for beloved Llama's, Ferrets, Dogs, Cats, Lambs, to name a few. If you or your pet, or both, were Pittsburgh Steeler fans check out the Gold glazing with a Tan border. S & H *** U.S.A. >> Either $12.00 or $15.00 depending on buyer's mailing address Zip Code. less than 780 please use this Paypal button. If your Zip Code starts with 780 or higher please use this Paypal button. This simple yet distinctive ceramic marker is handmade of high-fired, tan colored, stoneware. Featuring a yellow-orange (gold) and clear glazed surface for endurance and easy cleaning. The marker measures 2.5 inches wide, is 3/8 inch thick, and will range from 13 inches to 14 inches in height, depending upon the number of letters in the name. 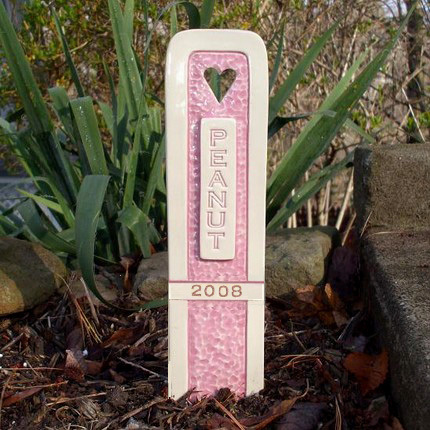 You choose the Pet's name to be stamped into the clay AND the design, HEART, STAR, CROSS or DOG BONE that is cut-out at the top of the marker; (Simply send a message with your Pay Pal payment with this information after purchase). Marker will be shipped in 7 to 10 days upon receiving payment and information. With drying time and firing - every piece is fired twice requiring a full day for each - the time required to complete the marker can vary. An email to you with the exact shipping date will be provided as soon as possible after completion so you will know when to expect delivery. For an additional $5.00 payment I can include the Date of Passing, Year of Passing OR Lifespan below the name see photo. Send me a message that you want one of these options and I will send an invoice with this charge added or I can send a separate $5.00 payment request through PayPal after your purchase. I take other special design requests for an additional negotiated fee. Item# BG-1-1 ----- Black & Gold Custom Ceramic Pet Grave Marker - Pittsburgh Steelers colors.